This photometric UBVRI filter set includes five 1.25" or 2" round mounted filters: ultraviolet (U), blue (B), visual (V), red (R), and infrared (I). The Optolong 1.25" or 2" UBVRI Filter Set is made with quality brand glass that has been multi-coated with an ion-assisted deposition technology to ensure scratch resistance and stability on the central wavelength, or CWL. 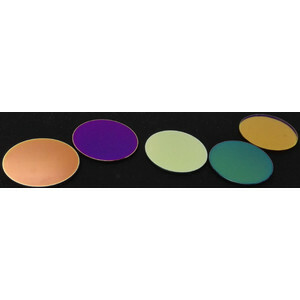 This filter set is designed to be used in color filter wheels that accept 1.25" or 2" round mounted filters. Filter substrate is fine-optically polished to 1/4 wave and <30 arc seconds deviation from parallelism over both surfaces. Each filter comes with a plastic case with high pressure EVA case lining.